Click on the above image for HUGE version. America has always privileged capital over labor (in the sense that capital gains have always been taxed at rates far lower than those for income, except for a brief period in the late 1980s). There is nothing inherently wrong with that, and it probably encourages capital formation, to some extent (thought to what extent is subject to serious debate) - but it is interesting to note that America has always valued capital over labor, in spite of any American rhetoric to the contrary. 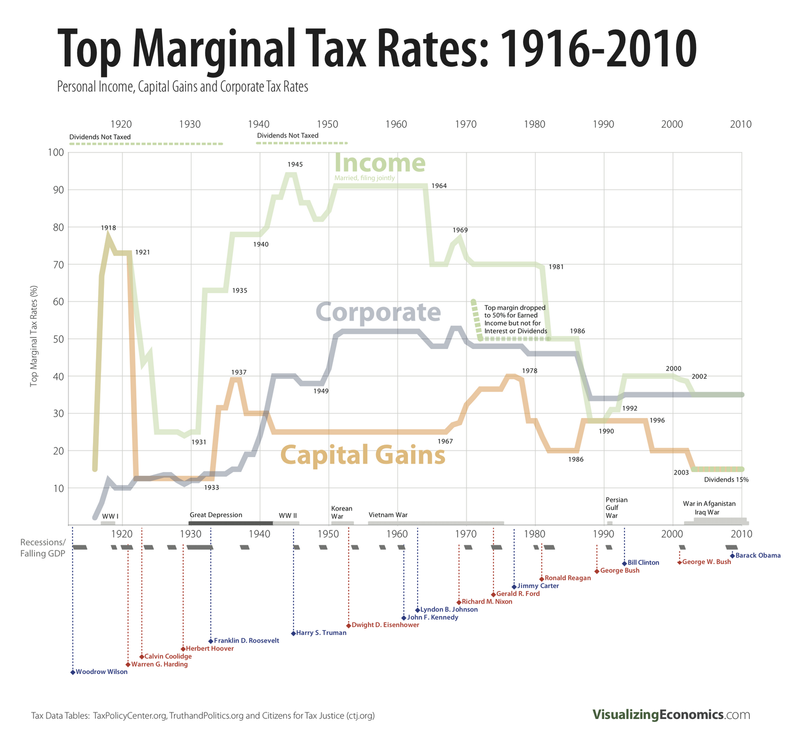 During the golden era of economic growth in the United States, from the end of World War II until the mid to late-1970s, marginal tax rates were set at a level that would today be considered punitive, socialist, communist, and a whole host of other nasty, inaccurate, derogatory terms. Yet, during that time, entrepreneurs still innovated, executives and workers alike still went to work, and businesses were founded, died, and flourished. This leaves me to believe that hysterical tales of how incredibly responsive people are to marginal tax rates are probably wildly overblown - I suspect that Bill Gates, Warren Buffet, Rupert Murdoch, Mark Zuckerburg, Mitt Romney, and pretty much any other wealthy person would continue to work just as hard if his last million in income were taxed at 70% (the rate under Nixon) or 50% (the rate under Reagan) as they do being taxed at ~35% now (or at ~15% now, if most of your income comes as capital gains, like Buffet or Romney). The era of ultra-low marginal tax rates on all forms of income is a relatively modern phenomenon - this trend didn't start until the late 1970s/early 1980s. Perhaps it's just coincidence, but this is about the same time that the U.S. economy stopped working for the poorest 80-90% of Americans - and the U.S. economy still isn't working well for the bottom 90% or so of Americans, and it's only working really well for the top 1% (or, even more so, the top 0.1%). If your economy isn't working well for more than 90% of your populace, it's probably time to rethink the way your economy works. Hell, even billionaire fat cats admit that the U.S. economy would be healthier and that the country would be more prosperous if the U.S. had extremely high marginal tax rates. In times of war, Congress usually raises taxes substantially in order to fund the war effort. The only time this hasn't happened was when the Bush Administration led the U.S. into war against Afghanistan and Iraq - while at the same time cutting taxes, instead of raising them! This unprecedented situation was the cause of much of the explosion is U.S. government debt in the past decade. Even though the economy has not been working for most Americans for the past three decades or so, the U.S. has continued to get richer and richer as a country (though most of the income gains have gone to the people at the top of the income distribution). As a country gets richer and has more resources at its disposal, it's only reasonable and rational that its citizens come to expect for the government to do MORE for its citizens, not less - especially since many of the things citizens want can only be accomplished through a massively coordinated effort that only a government can provide (or that a government can provide most efficiently / must subsidize or promote heavily) - for example, highways, high-speed rail, security and public safety, an economic safety net, health care, clean air, clean water, etc. In this sense, conservatives who advocate for smaller government are battling against the tide of history, and despite occasional short-term victories, I wager they'll lose in the long run. So, yes, there are a lot of interesting stories buried in this little chart. What stories does it tell you? Labels: Bubbles, Economics, History, Ideas, Politics, Social Trends, Taxes, U.S.